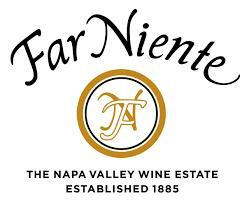 Far Niente was founded in 1885 by John Benson, a forty-niner of the California gold rush and uncle of the famous American impressionist painter, Winslow Homer. Benson hired architect Hamden McIntyre, creator of the former Christian Brothers winery--now the Culinary Institute of America at Greystone--to design the building. Constructed against a hillside in western Oakville, Far Niente functioned as a gravity flow winery, gently moving the grapes through each stage of production. Far Niente prospered until the onset of Prohibition in 1919, when it was abandoned and left to fall into disrepair. Sixty years later, in 1979, Gil Nickel purchased the winery and adjacent vineyard and began a three-year restoration of the property, which resulted in placement on the National Register of Historical Places. During restoration, the original name, Far Niente, from an Italian phrase that romantically translated means "without a care," was found carved in stone on the front of the building where it remains to this day. We felt an obligation to preserve the name with the hope that we could recapture a bygone era when life was indeed without a care. Nineteen eighty-two marked the return of winemaking to Far Niente, with the harvest of the winery's first Cabernet Sauvignon. Chardonnay was also produced at the winery for the first time that year; the 1979, '80 and '81 vintage wines were made at an offsite location. Today, the winery continues to focus on producing only the two varietal wines. Wilfred Wong 94 "A historically top-notch Chardonnay, the beautifully crafted 2016 Far Niente comes to the fore with superb ripe fruit and balance. The wine's combination of dried peach skin, bright minerality, and wood accents would pair it handsomely with lobster in a lightly savory cream sauce.
" The 2015 Far Niente Cabernet Sauvignon has deep concentrated aromas of chocolate-covered cherries alongside bright floral notes. The entry of this wine is juicy with a silky-smooth texture that builds through the mid-palate. Mouthwatering dark cherry flavors are supported with well-integrated oak.